A good introduction is an invaluable asset. My fixer, Sagvan Murad, was a young and active member of an ancient religious community called the Yezidis. They numbered about half a million people in Iraq, the bulk of them living south of the front line and under Saddam Hussein’s government control. Murad told me that community leaders on the side that was free, liberated, and developing since 1991, had organized a plan for a smooth takeover of the Saddam-controlled areas. 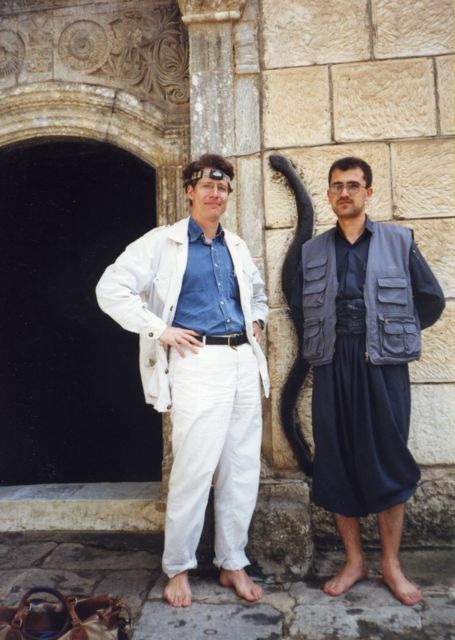 It was his boss in a Yezidi cultural center, a part-time guerrilla chief, who had invited us to accompany them south when Saddam’s control collapsed. This offer of open access to whatever awaited these Yezidis presented what I thought was my best bet for an original story about the northern front of the Iraq War. Here was something that might go right, as opposed to what I felt to be the great wrong of Operation Iraqi Freedom. Yezidis might seem obscure, but they were as Iraqi as Kurds, Sunnis, Shias, Assyrians, Marsh Arabs, Sabaeans, and all the other subgroups that made up the country’s twenty-five million people. After all, if the war was on behalf of human rights and democratic freedoms, the Yezidis were the kind of issue it should have been all about. The Yezidis had princes, castles, fortune-tellers, and an unusual religion. A subgroup of the Kurds—in their eyes, they were the original Kurds—their ancient faith was, to say the least, notably different from any of the surrounding patchwork of religious cultures. Indeed, Yezidi priests were so secretive that their exact doc- trines were a mystery even to most of their adherents. Since they were Kurds, not orthodox Muslims—possibly not Muslim at all—they had been subjected to plenty of discrimination, or, as the Yezidis put it, “seventy-two genocides,” which put them high on the scale of oppression, even in the Middle East’s competitive arena. Mus- lims and others even put out the scandalous rumor that Yezidis worshipped the devil, which was entirely untrue. As he halfheartedly agreed to my war strategy by satellite telephone, the long-suffering [Wall Street Journal editor] Bill Spindle added the warning that my story would have to be very strong to make it to the front page. I knew I faced a great challenge. Like the rest of the Kurds, the Yezidis were part of the solution, not the problem. They were marginal and inherently unnewsworthy. Still, whatever my story about the Yezidi northern front lacked in confrontational punch, I reckoned I would be able to make up in telling details about one alternative, peaceful method of taking over a chunk of Saddam Hussein’s Iraq. 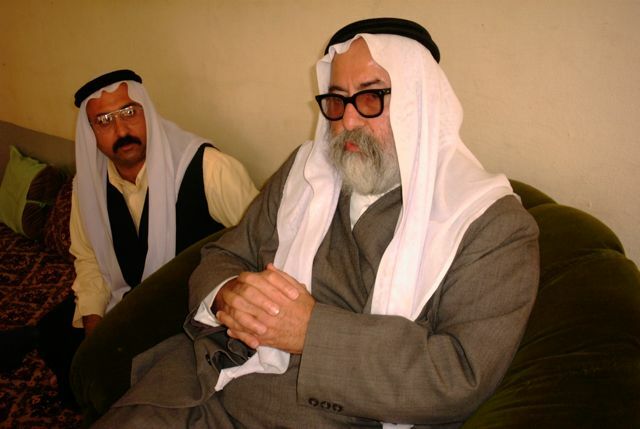 Early on, Murad had introduced me to the leader of the “free” Yezidis, Prince Kamuran, a nephew of the overall prince who lived in the Saddam-controlled areas. Prince Kamuran dressed the part, wearing a splendid baggy costume in fine stripes and a pale red-and-white head scarf. He had invited me to stay at his palace in the village of Baadra, from where, he said, I could see the lights of Mosul at night or, when the war started, the smoke of high explosives from any bombing by day. While waiting for our part of the front to become active, I took the prince up on his invitation. My first sight of Baadra seemed to justify the whole journey. In a valley I saw the metal tanks and cinder-block huts of one of the principal smuggling routes for petrol between the government areas and free Iraqi Kurdistan—still open for business, despite the war, the Nowruz holiday, and the fact that night was falling. A steady stream of donkeys was arriving from the hill between us and the Saddam-ruled area with hard plastic jerry cans of fuel strapped to their saddles. We pulled up and soon the driver was sucking on hoses and juggling containers to fill our car. 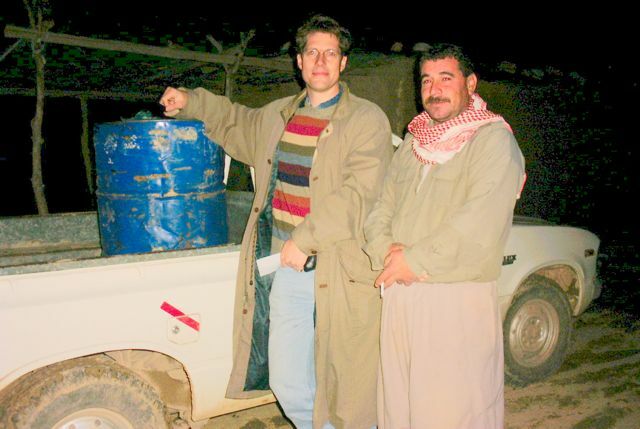 I then bought a whole blue barrel of benzene—fifty-five gallons—and sent it down to Dohuk by pickup truck. It cost me just $85, and now I had my own private gas station. “Thanks very much,” I told Rashid, the cheery Yezidi seller, as he pocketed my money in his baggy khaki pants. He soon brought me back to earth. I said I agreed with his sentiments entirely, and drove on to the prince’s palace. On a bluff with its back to Baadra, it overlooked the government-held valley that led to Mosul. It was neither particularly grand nor humble, a one-story, thick-walled structure built around a square courtyard with some trees and the obligatory little English lawn. Prince Kamuran was waiting in the corner of his reception room, next to his Thuraya perched precariously on a windowsill. He greeted us with practiced and roguish ease. Iraqi arak appeared for me, as did some whisky for Murad and Turkish beer for the driver. On the wall was an erratic array of pictures: his princely father, a Yezidi holy peacock, and Richard Nabb, the legendary American colonel whose careful pushes forward did so much to make Iraqi Kurdistan a feasible zone in 1991. There was also his father’s ancient-looking sword, its scabbard tied together with a ragged strip of cloth and its handle bound with dirty string. We sat on an assortment of stuffed armchairs and stools lined up around the edge of the room, which was dominated at one end by a grainy television screen. Servants arrived with fruit, Pringles and, in the end, two plates of mushy, well- seasoned chicken-and-vegetable stew. “We always used to kill a lamb for visitors, but then we realized you never ate it,” the prince joked, zapping through the channels of his television. It was true that such Middle Eastern lambs could turn out to be tough, smelly old sheep, but I kept my counsel. Our unpromising conversation faltered and crashed as live news streamed onto the screen of the first big U.S. bombing of Baghdad, 240 miles to the south. We all rushed up to the roof, expecting explosions when the U.S. planes and missiles reached the city of Mosul, whose lights glowed silently on the horizon to the south- west. A few antiaircraft shells lofted into the air. We began to get cold in the open. The prince had a better idea. The bombardment of Baghdad didn’t satisfy my host, however. “You have to bomb the whole of Iraq to bits before there will be any collapse in the armed forces. Saddam’s terror machine cannot be derailed by anything else!” the prince declared. Annihilation of the enemy might be the house rule in Mesopotamia, but I couldn’t agree it would do much good. I was sure many innocent people were getting killed and injured in the hail of destruction raining down on the Iraqi capital. In faraway America, a retired U.S. general doing analysis for CNN declared that “it really is a symphony that has to be orchestrated by a conductor.” When Secretary of Defense Rumsfeld appeared to talk about how carefully targets had been chosen, the prince laughed in scornful protest. “You can’t fight Saddam like that,” he scoffed, and switched to al-Jazeera. The prince didn’t like al-Jazeera’s anti-U.S. politics, but he did prefer the local perspective. At the height of the bombing, the Qatari satellite channel just let us watch the massive mushroom clouds billowing up into the Baghdad night sky, underlit by new and continuing explosions. I felt sick. It looked like Armageddon. I retired to an uneasy sleep under a thick, heavy, cotton-packed duvet. I woke up to take stock of my palace quarters: a thin carpet, a blanket over the unwashed window, a rickety plywood cupboard, hooks to hang clothes on, and, in a nod to the prince’s British tastes, an iron bedstead with sagging springs under the thin mattress. The morning news on television was now nonstop war fever. Back on the roof, I scanned the entirely peaceful front lines below me. The hours ticked by. It was hard to know what to do in this town of about one thousand flat-roofed, mud-brick houses. Apart from watching TV, my only distraction was trying to work out the protocol when the prince’s wife emerged from her private harem in a voluminous purple gown to enjoy a cigarette in the courtyard. It was an idea, at least. On the way we toured the old castle of the great Yezidi princes, in ruins and abandoned behind its high walls. Our guide, Saeed, another offspring of the Yezidi princely dynasty, took particular pride in showing the unassuming room where, in 1913, rivals in a struggle for the princedom had smuggled themselves into the citadel dressed as women and had bludgeoned the old prince to death. Despite his tatty leather jacket, Saeed was also a peshmerga officer who in 1991 had engineered the capture of the government’s vast yellow Foreign Legion–style fort overlooking the town. This had brought Baadra into “free” Iraqi Kurdistan. It had been, he boasted, a bloodless advance with ten men, after which the Iraqi soldiers were allowed to walk home with their luggage. Like the primary school next to the prince’s palace, the fort was now overflowing with peshmergas. If the order came to chase a fleeing Iraqi enemy, I supposed they might move forward. Once again, Murad promised that we had been assured of a place in the vanguard. A short walk away down the ridge, the fortune-teller, Shammu, sat cross-legged on a thin cushion on a worn-out floor covering in his gloomy, flat-roofed house. Thick dark glasses covered his eyes and a colored map of the signs of the zodiac hung above his turbaned head. Large-scale maps of the world torn from newspapers and some sparkly women’s dress material covered parts of the mud wall. The roof was held up by round poplar beams, and I could see stones from the mud roof pushing through the interwoven branches above. A former road-building contractor, Shammu had found his current calling after being exiled for his Communist leanings and sentenced to build highways in Iraq’s western desert. Almost in passing, Murad whispered that his wife had been shot dead by the Baathists in 1981. The ex-engineer certainly had a scientiFIc approach. He checked me in as his 10,519th consultation. Many of his star charts had been neatly precalculated in a child’s notebook. He knew how to please by giving me positive prospects for wealth, sexual performance, openness, courage, and prescience. I was beginning to doubt the value of the exercise when my ears pricked up. Such talk gladdens any hardworking journalist’s heart. I slipped him a couple of bars of Turkish chocolate, and soon it became “the big prize.” Months later, I duly applied to a modest competition for foreign correspondents, in which I told myself that I had a chance of recognition for my efforts to warn America of the dangers of the Iraq War. The prize givers didn’t acknowledge the entry. Similarly not as predicted, my child born two months later was a girl, not a boy. I received no great sum of money. I had no “heavy” social life. And instead of being offered a great new job after September, the futility I felt covering the Iraq War made me entirely lose my appetite for writing about the Middle East for the Wall Street Journal. Some eighteen months later I left the paper to build a house on a remote Turkish mountainside. Clearly I was wrong to hope for much from the little backwater of Baadra. Perhaps the flaws in Shammu’s predictions derived from an alphanumerical calculation based on my name, which has no standard Arabic spelling, and that of my mother, which once again made everyone worry. In any event, he hedged each prediction with an invocation of the divine. “How can you be a Communist and say these things?” I asked politely. He saved his best line, though, for when I returned later to check something he’d said. I also did what many of his supplicants had done, it seemed: I asked what the stars had in store for Saddam Hussein. For this he extracted a loose-leaf page closely ␣lled with calculations. Not much surprising in that—Saddam’s name, perhaps, having the proper Arabic astrological equivalent. What perplexed me, though, was the reaction of colleagues and interviewees over the next few weeks. I had become used to talking little at dinners and get-togethers. I had no daring escapades to boast of from the front lines and my antiwar commentaries were unfashionable. But whenever I let slip that I had the details of Saddam’s horoscope, everyone fell silent, gathered close, and hung on my every word. I was clearly working in the wrong sector of the prediction business. Perhaps it was partly my status as a Journal correspondent that was dignifying the fortune-teller’s words, even if I was joking. American newspaper readers were also, I felt, beginning to distinguish between the message they received and the messenger. Due to the careful way that mainstream newspapers framed their re- porting about Iraq, paradoxically done partly in order to make readers read the stories, Americans seemed to be losing trust in our traditional, objective prose. Circulation figures were sagging, but the Journal was determined to stay high-minded. Publisher Peter Kann once told me and a group of trainees that, since many subscribers were retired people, we should just imagine we were writing for our parents. Yet readers still seemed to believe in us reporters on the ground, provided that we were legitimized by representing traditional media institutions. My colleague Farnaz Fassihi experienced this after the war, when she wrote a gloomy assessment of the situation in Baghdad in an e-mail to friends. The substance contained little that she had not written in the pages of the Journal. But precisely because Americans perceived it as the real opinion of a credible correspondent, rather than a newspaper-processed authorized version, the letter whizzed around the Internet and within days became famous as a more real truth. There was good reason for Americans to believe that Journal reporters knew what they were talking about. I never attempted a major story for the paper before I’d filled a notebook or two with interviews. In the past weeks, I’d made sure I did that for the Yezidis too, especially since it was a good way to keep myself occupied away from the front. On the seventh day of the war, for instance, I tracked down a young Hungarian doctoral student in Dohuk and spent the day discussing her thesis, “Gnostic Elements in Yezidi Mythology.” From the beginning I knew that Eszter Spät and I shared the same mad stamina for digging up the obscure paradoxes that are the warp and weft of the Middle East. The building blocks of early Christian theology, all of which developed in this general area of northern Syria and western Iraq, were as toys in her hands. According to her, Yezidism had incorporated a good deal from these pre-Islamic times. When our discussion turned to whether or not the sum of Yezidism could even be said to be older than today’s Judaism, I invited her to continue our conversation over lunch. Then Jon Hemmings from Reuters pitched up at the next table and the present imposed itself. He had just come from a hilltop lookout on the front a few miles to the south. He had watched U.S. bombs rip up a village in the plains below, where several rows of Iraqi army barracks stood. He’d filmed this on his digital pocket camera. We played the recording of the rising columns of smoke again and again, somehow disbelieving the reality of the small puffs appearing on the back of his palm-sized machine. At five p.m., al-Jazeera reported an Iraqi claim that fifty local villagers had died in the attack. After the war, Spät visited the bomb craters, saw that they were around military targets, and heard of no civilians killed. In any event, real fighting was clearly imminent on the northern front. Murad had been phoning our Yezidi guerrilla contacts regularly to make sure they didn’t make their move to take over the Saddam-ruled areas without us. Nevertheless, in the confusion of those days, they did so. Not being with them as they crept or charged through the lines was another strike against the likelihood that my story would make it to the front page. But, as I was now practiced at telling myself, I was no photographer needing to be on the scene. I wouldn’t give up. I could follow in their footsteps and piece the story together. On the way, Murad and I paid a call on the mecca of the Yezidis, the shrine of Sheikh Adi at Lalish, whose fluted, conical spires are tucked into an idyllic mountain valley near Prince Kamuran’s village of Baadra. I made the halt because Tahsin Beg, Prince of All the Yezidis of the World, had sent word that he would receive us at the shrine. We parked and passed through a low, narrow corridor in a stone wall, headed up some steps, took off our shoes, and found him holding court behind a colonnade. Yezidi men sporting long mustaches with a parting in the middle sat on the thin cushions around the walls. His armed guards milled about the courtyard with all kinds of weaponry strapped to their chests. Tahsin Beg—Beg is a title, the equivalent of Sir in Ottoman times—had inherited his position as a child an extraordinary sixty years before. One result was that he received only a primary school education. Another was that he yearned for freedom, not just from Saddam but from his communal duties. Indeed, while talking to him, I got the impression he had been happiest during a seven-year stint of exile in London’s Kensington High Street, mostly living alone and washing his own dishes. He now sat in state on a green armchair whose sides had split and from which sheets of cardboard were poking out. His dark gray robes were the worse for wear, and his 1970s black Rado watch, with a wide gold rim, was wearing out around the bracelet. His English had become rusty from disuse. At this moment three of my correspondent colleagues arrived. Luckily they were the three I got on with best, and none worked for American media. But my heart sank at yet another strike against my plan. So much for my hopes of being able to craft an exclusive Yezidi narrative from the northern front. “Ask me any questions!” commanded Tahsin Beg. I was shocked at the bluntness of this question. I knew from Murad and Spät that the Yezidis revere a benign angel they call Azazil, or the Peacock King, and that they get upset that outsiders, notably Muslims, keep identifying him as the devil. As a result, the word for Satan was actually banned by Yezidis. My other Yezidi princely friend, Tahsin Beg’s nephew Kamuran in Baadra, would refer to him only as “so-and-so.” Tahsin Beg, however, was used to dealing with the question. Murad and I then set off to join the newly liberated people of Ain Sifni, a town a few miles to the south. Crossing into no-man’s-land sent a frisson down my spine. From the escarpments above us we were watched by the blank holes of the sand-bagged foxholes in the old Iraqi front line. Then came the old Iraqi checkpoint. Comprehensively rocketed and shot up, there was satisfyingly little left but smashed-up old slogans. The only one still legible was IRAQ IS FOR US ALL, AND LOOKING AFTER IT IS THE RESPONSIBILITY OF US ALL. The front wall of the Baath Party building was already rebranded for the militia that was its new master, the “Party” of Brother Masoud, which ran this part of Iraqi Kurdistan. In the main slogan above the front door, someone had crossed out the “Saddam” part of YES, YES, TO SADDAM and had spray-painted “the Party” in its place. Living in Middle Eastern countries can sometimes be like attending kindergarten for your whole life. The “Party” and its U.S. backers had taken no chances with their takeover. The streets were still littered with debris from an eight-hour bombardment. Perhaps two dozen Iraqi army defenders died in the surroundings, mostly shot as they fled. But thanks to the preparations by the Yezidis, like establishing secret contacts with major figures in town, there had been minimal fighting. Kurdish guerrillas deterred looting with checkpoints and guarded untouched districts of plush, empty houses once occupied by people close to the regime. They were determined not to repeat the mistakes of the liberation of the north in 1991, which had been accompanied, as was now happening in the U.S.-controlled south, by widespread stripping of public buildings, reprisals, and disorder. Within four days of the liberation, engineers in hard hats could be seen climbing pylons to fix high-voltage cables snapped by bomb blasts. Elsewhere I met officials who were sorting out the records of telephone line subscriptions. Party officials sifted through documents from government buildings, some of them flattened in the bombing. Sitting cross-legged on thin cushions, making reassuring visits and holding long meetings, they quietly took up the reins of power. 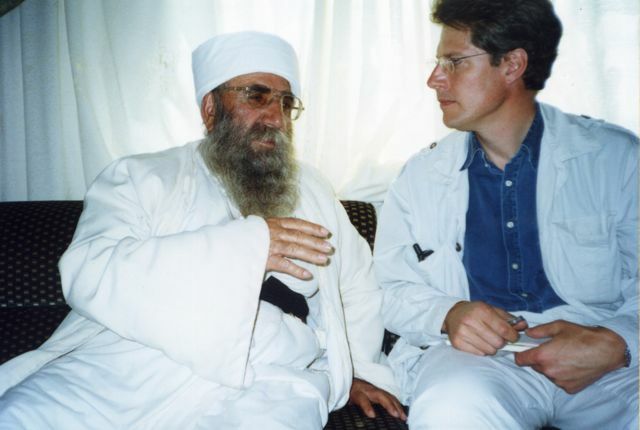 With Khatto Baba Sheikh, Ain Sifni, 2003. We called on Khatto Baba Sheikh, the spiritual leader of the Yezidis. Seated at one end of a long rectangular reception room, he looked impressive: a long, finely combed black-and-gray beard, white robes, and a tightly wound turban. He offered me the seat of honor beside him at the head of the assembly. But he couldn’t speak Arabic very well, and I didn’t get much out of him as everyone bantered about one of the most unusual weeks in the history of the town. Murad had a question. In proper fashion, he wanted to check with the religious leader whether he had any objection to his smaller community of Yezidis from free Iraqi Kurdistan going forward and proselytizing the much greater number who had been stuck under the regime of Saddam Hussein. One of his hesitations was that the much-oppressed Yezidis are highly reticent when it comes to revealing religious matters. One of those responsible for the previous lack of freedom was sitting uncomfortably on one edge of the majlis gathering in Baba Sheikh’s reception room. Hazem Haydar was one of the 100 to 150 former Baath Party officials in the town and had taken refuge with the religious leader. I asked to see him on his own. In a guest room we sat on parallel iron bedsteads and chatted. His eyes, constantly seeking reassurance, showed that he could hardly believe his luck would last. He had not been killed. When he surrendered his gun, he had been given a receipt. It was in his native Kurdish, which he had never seen written down. Now for the first time in his life he was meeting a foreigner and using the musty English he’d learned at school and kept on life support by buying copies of Saddam’s Iraq Daily. What could be next? “Did you expect to survive?” I asked. We drove on through Ain Sifni. Shops were gradually reopening, and a few cars full of visitors or relatives cruised the streets like tourists from the already liberated areas to the north. It was sobering to see how Arabized this Kurdish town looked. There was not a single sign in Kurdish, as had now become the norm in Iraqi Kurdistan. It was uplifting, too, to see how quickly shopkeepers get fresh fruit and vegetables back onto their stalls after a conflict. We passed by a school where many Iraqi army soldiers had been hiding for the last week before they ran away. Although the American pilots could see them there and circled overhead, they did not bomb them, which would certainly have killed plenty of civilians. Indeed, in the liberated areas that I toured, U.S. warplanes seemed mostly to have hit what they aimed at, flattening barracks and party buildings. The Foreign Legion–style forts were all left looking as though some giant had taken a huge bite out of each one, scattering crumbs of stones everywhere. The trouble for U.S. policy was that this technical proficiency was not part of any overall plan to sort out the huge psychological and other dysfunctions of Iraqi state and society. Then there was the collateral damage. One fifteen-foot-deep crater in Ain Sifni was dug by a bomb dropped by an American pilot aiming at a Toyota pickup truck with a gun mounted on the back. The Toyota was now a pile of burned and twisted metal, the engine block lying dozens of yards away. The Baathist who had sought asylum in the Yezidi sheikh’s home told me that a local Arab had been using it to shoot at the American planes. When the planes closed in to bomb, this man wisely hid behind a wall to save himself. But the explosion torched at least three cars, wrecked four or five houses, and sprayed shrapnel in a radius of fifty yards or more. It had ripped the living room wall off the nearest house, killing a man and blinding his wife. People milled about, poking and pulling at things. “First they bomb us, then they come and take photographs of us,” Murad overheard someone saying as we left the site. Eventually I caught up with the guerrilla leader who had promised and failed to take me along with the first wave of liberators of Ain Sifni, Khayri Namo Sheikhani, a forty-five-year-old Yezidi activist from Dohuk. “How come the takeover was such a mess elsewhere, and so smooth here?” I asked. Down the road in Mosul, there was already virtual anarchy despite a far greater U.S. presence. I drove with Sheikhani to the settlement of Babir, north of Mosul, abandoned by Iraqi troops and therefore liberated. Babir was one of Saddam’s notorious “collective towns,” where any Kurds who might support the never-ending Kurdish rebellions were resettled from their ancestral villages in the mountains. In theory, all Saddam’s army had to do to control them was to park a tank at the end of each unpaved street on the grid. When we reached the town, Sheikhani and his lieutenants got out to greet the notables. The houses were all walled-off, one-story miniature compounds built of gray concrete blocks. In no order whatsoever, we advanced on foot, followed by the cars, into the town’s main open space, a kind of dustbowl in the center. A few hundred people clamored around us. All were Yezidis. Sheikhani and Fariq Farouq, an official from “the Party,” climbed onto the back of the truck. They were greeted by chaotic, frenzied shouting. Sheikhani and Farouq looked on indulgently. Sheikhani then began the first political speech that any of them had ever heard live in Kurdish. He told them that the Baath regime was finished and that Arab rule was history. He talked of the many sacrifices of the struggle. Farouq from “the Party” took the microphone and thanked God that they were liberated, reminded them they had been persecuted for thirty-five years, pointed out that the Baath had lied to them saying they were Arabs, not Kurds, and told them that Masoud Barzani called the Yezidis the original Kurds. He named a famous Yezidi martyr for the cause. Rounds of hearty clapping greeted these sentiments. Then Farouq moved onto less familiar territory. “Freedom should not be for some, but for all—Kurds, Arabs, Turcomans, Christians, Muslims. We are all Iraqis. We want to work together for this land. We are asking for democracy, brotherhood. Even the Arab people say, ‘Long Live Barzani!’ ” he said. The mention of Arabs earned him a sudden drop in applause. “We will forgive those Baathists who didn’t do evil. We have to respect them. We want the rule of law, human rights, the rights of minorities, which we have established in Kurdistan,” Farouq said. I checked what the man beside me, Edris, thought. No, he wasn’t interested in cohabiting with Arabs. He saw them solely as oppressors who had robbed him of his land and who had occupied his village. His only priority was to rebuild the village and, if he had a political outlook at all, to live in free Kurdistan. Right now, he never wanted to see an Arab again. I turned to the people around Edris to ask if a pluralistic future was really so impossible. But I could get no sense out of people who had been under so much stress and who had no educational equipment to articulate their new freedom and excitement. We jostled, we shouted, we joked and laughed about silly things. I asked them about the Yezidi gerîvan, the special white undershirt with a rounded neck cut open by a specially chosen relative, and half the men started unbuttoning their shirts to show me the thin fabric of the garment. I parried invitations for tea, dinner, to stay the night. “Do you have a picture of Bush? I want to kiss it!” one man begged me. “Give my love to Mr. Bush and . . . what is his name? What is his name? Mr. Blair!” shouted another into my ear. “Thank you, thank you, thank you,” shouted one man as I fought through the crowd to get back into the car. Back in Dohuk, I watched the big-screen TV in the hotel lobby as it showed the live action from Baghdad’s Paradise Square, right in front of the Palestine Hotel, where I always used to stay. I remembered how exactly a year before I’d seen them put a new statue of Saddam up on the new roundabout reservation, wrapped in sheets as one of his birthday presents. Now a U.S. soldier pulled a noose around the statue’s neck. A U.S. armored vehicle took up the strain. It bent down, fell forward, bounced groggily, and was then dragged to the ground. We were tuned to Abu Dhabi TV, and the announcer, a good Arab, was in shock at this show of disrespect. “The body has come down, but the feet are firmly stuck in place. Let’s see whether that is an omen for the future!” he declaimed. Soon we were watching crazy kids dragging the head around for rides and hitting it with their shoes. The camera panned back to take in the whole square. The TV announcer was right about it not being so easy to extirpate all signs of Saddam. You couldn’t see it on TV, but I knew that each one of those white columns around where the statue stood had the initials S.H. molded into its capital. Baghdad was now swarming with embedded correspondents from the Wall Street Journal. I could go home. I had one last page to fill in my notebook. Bill Spindle, valiantly struggling to get my alternative narrative of the conquest onto the front page, suggested that the first paragraph would be livelier if the commander had some kind of Yezidi fetish that he took along with him to liberate the Yezidi zone. I had long stopped resenting such requests. They always turned up something new. But it did mean more delays, and I began to suspect the worst for my story. I caught up with Sheikhani and maneuvered toward the question on my editor’s mind. The former dermatologist spoke good English, but it took some time to explain the Western concept of lucky charms. “No, I don’t have anything like that,” Sheikhani said. “So you don’t wear the gerîvan?” I asked, the only Yezidi thing I could think of. “Oh, no, I never wear that.” He laughed at such an absurd, anachronistic idea. “I always used to carry a bag of medicines. I was the peshmerga doctor,” he said. “Did you take any medicines with you on your night march, then? A few days later, the Journal’s front page passed on my report on the peaceful change of power in our corner of Iraq. Spindle explained that editors felt triumphant events elsewhere overshadowed the Yezidi angle. I was beyond arguing and could do nothing about what I suspected was the last flaw in my Yezidi tale: Although the U.S. invasion made the Yezidis’ success possible, and U.S. warplanes were a critical backup for the takeover of Ain Sifni, no Americans were obviously involved in the narrative for readers to identify with. By then I was out of the country, not greatly proud of my achievements but pleased that the foreign pages had published my last report at length and delighted to have survived to see my family and friends again. A few years later, Murad rose to somewhere miraculously appropriate for his high standard of traditional politeness, becoming acting head of protocol for President Jalal Talabani of Iraq, photographed behind the scenes of world summits with President Bush’s arm draped around his shoulders or being kissed by Iranian President Ahmadinejad. The Yezidis’ fate was less happy. They suffered along with other minorities like the Christians, and lots of ordinary Iraqis, as the United States dumped well-laid American plans for running the country. Sunni Muslim extremists used the chaos to engineer a steady campaign of murders of Yezidis. One of the worst was in April 2007, when, apparently in revenge for the Yezidis’ stoning of a Yezidi girl betrothed to a Muslim boy, Muslim militants stopped a bus, pulled off twenty-two with identity cards identifying them as Yezidi, and shot them dead. Ethnic cleansing forced many Yezidi families to flee their homes. An al-Qaeda– style quadruple truck bombing in August 2007 killed another two hundred Yezidis in villages and small towns in my eccentric friend Hussein Sinjari’s tribal district of Sinjar, a formerly Saddam-ruled area east of Mosul. Tahsin Beg went on to survive at least three attempts on his life.